Dr D.P.Singh the Principal R.N.T.Medical College said the above statement as per his experience as he himself in his house & in Maharana Bhopal Hospital installed this system. No microbial contamination occurs in hospital when roof top rain water harvesting is done to recharge the water body in the hospital or clinic. Former President of the Rotary club Laxman Singh Karnawat said that due to excessive removal of the sand from the river bed the stones of bottom are not retaining the water .Both social & Government organizations should begin the awareness program to save the rain water during rain and in daily usages during non rainy seasons. Dr H.L .Khimesara the senior Urologist and former Head of department of surgery inR.N.T.Medical College says that if you want to prevent stone formation in the kidneys take lot of water. He narrated a study of Israel where in one village the people were asked to drink sufficient pure water and the other villager followed their own way of drinking. The people who used to drink sufficient water had 30% less incidences of stone formation in their kidneys. So rain water harvesting is the best way to get purest form of water. Pramod Jhanwar the President of MarutiSevaSamiti emphasizes that no wall to wall road construction be done in the street and some space should be left for natural recharge of rain water through this space .He also says that a layer of sand should be there below Interlocking tiles are installed so that natural rain water can percolate through the sand .Rain water harvesting is the only way to save the water for future generations. J.S.S(JalsarakshanSamiti).Meet A meeting of J.S.S. 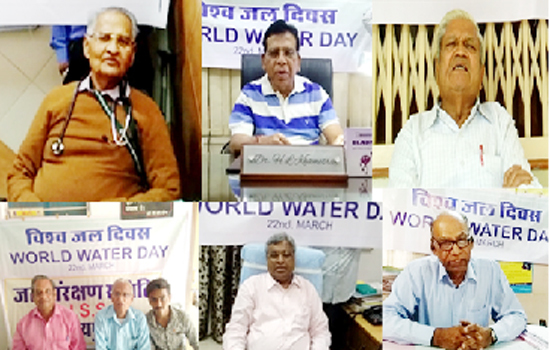 ( JalSarakshanSamiti) of students of Guru Govind Singh Senior secondary School was also conducted here on this day 22March 19 to celebrate world water day . They were shown the technique of Dewas water Filter by Dr P.C.Jain through which roof top rain water is passed into the casing of the Bore –well ,well ,tube well.